The Ulster University Library has a growing collection of electronic books, also known as eBooks. There are over 5,000 eBook titles on the Library Catalogue, and we are continually adding individual e-book titles where they meet the requirements of teaching and research at Ulster. eBooks are available across all subject areas, and can be accessed from anywhere at any time. 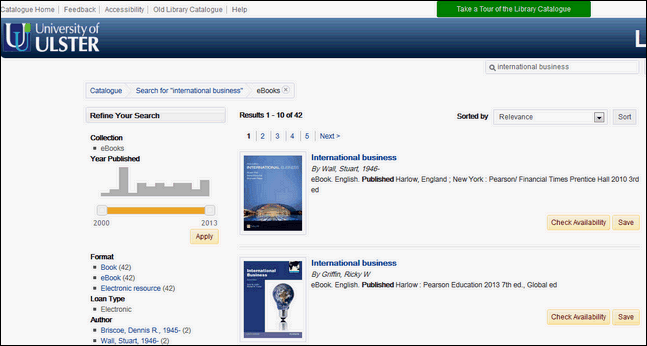 You can print or copy selected sections of eBooks, and search for keywords within the text of the book. The location of the book is displayed as 'E-library' and a link is provided to access the full text of the eBook. Many eBook suppliers require users to login via the OpenAthens authentication system in order to access the full eBook. Once you have logged in via OpenAthens, you will not be prompted to login for other eBooks, or e-resources, during your browsing session. In addition, there are over 700,000 other full text books available via various resources on the Library databases page, many of which do not appear in the Library Catalogue. The main solely full text eBook collections are listed below though there are many other scholarly databases which contain eBooks. These can be discovered by exploring your Library subject guides and databases pages or by just contacting us. Contains full text or page images from over 350,000 books published in England from 1475 to 1900. Draws together content from two of the best-known and longest-established early book collections (EEBO & ECCO), as well as unique titles from the British Library 19th Centure Collection. This IET eBook collection provides unlimited access to 400+ highly specialised publications via an advanced online platform with improved accessibility, display, navigation & mobile enabled views. A fully searchable library of 330,000+ works of English and American poetry, drama and prose, plus biographies, bibliographies and key secondary sources. Books for computing, programming and information Technology.